Abstract: Timely and accurate change detection of buildings provides important information for urban planning and management.Accompanying with the rapid development of satellite remote sensing technology, detecting building changes from high-resolution remote sensing images have received wide attention.Given that pixel-based methods of change detection often lead to low accuracy while object-based methods are complicated for uses, this research proposes a method that combines pixel-based and object-based methods for detecting building changes from high-resolution remote sensing images.First, based on the multiple features extracted from the high-resolution images, a random forest classifier is applied to detect changed building at the pixel level.Then, a segmentation method is applied to segement the post-phase remote sensing image and to get post-phase image objects.Finally, both changed building at the pixel level and post-phase image objects are fused to recognize the changed building objects.Multi-temporal QuickBird images are used as experiment data for building change detection with high-resolution remote sensing images, the results indicate that the proposed method could reduce the influence of environmental difference, such as light intensity and view angle, on building change detection, and effectively improve the accuracies of building change detection. MATIKAINEN L, HYYPP J, AHOKAS E, et al. 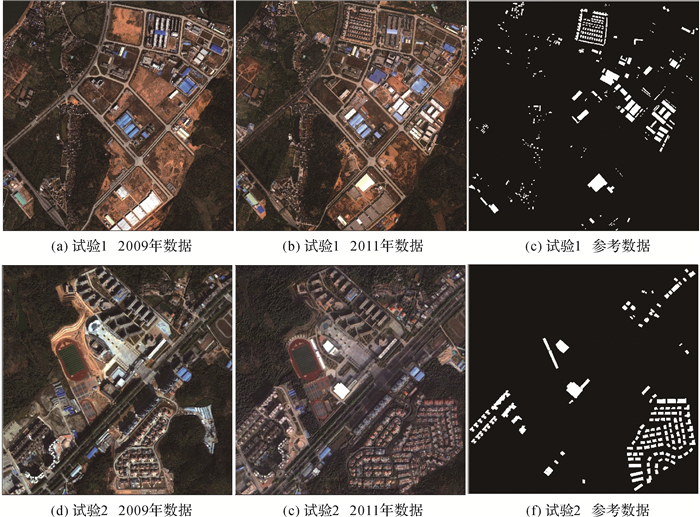 Automatic Detection of Buildings and Changes in Buildings for Updating of Maps[J]. Remote Sensing, 2010, 2(5): 1217–1248. 张永梅, 李立鹏, 姜明, 等. 综合像素级和特征级的建筑物变化检测方法[J]. 计算机科学, 2013, 40(1): 286–293. ZHANG Yongmei, LI Lipeng, JIANG Ming, et al. 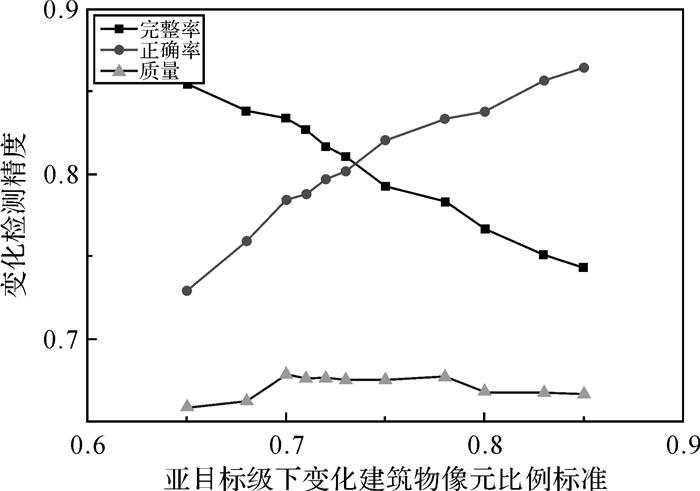 Change Detection Method for Buildings Based on Pixel-level and Feature-Level[J]. Computer Science, 2013, 40(1): 286–293. 李亮, 舒宁, 王凯, 等. 融合多特征的遥感影像变化检测方法[J]. 测绘学报, 2014, 43(9): 945–953, 959. 佃袁勇, 方圣辉, 姚崇怀. 多尺度分割的高分辨率遥感影像变化检测[J]. 遥感学报, 2016, 20(1): 129–137. DIAN Yuanyong, FANG Shenghui, YAO Chonghuai. 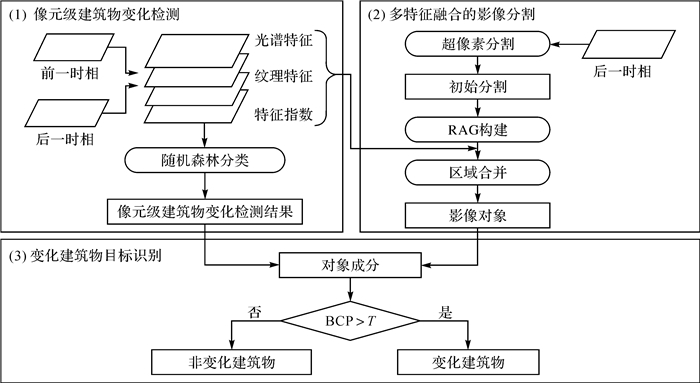 Change Detection for High-Resolution Images Using Multilevel Segment Method[J]. Journal of Remote Sensing, 2016, 20(1): 129–137. 杜培军, 柳思聪. 融合多特征的遥感影像变化检测[J]. 遥感学报, 2012, 16(4): 663–677. 兰泽英, 刘洋. 领域知识辅助下基于多尺度与主方向纹理的遥感影像土地利用分类[J]. 测绘学报, 2016, 45(8): 973–982. 胡荣明, 黄小兵, 黄远程. 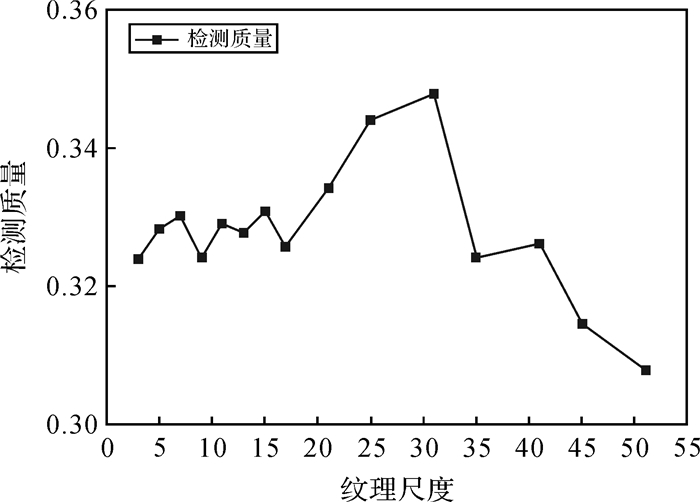 增强形态学建筑物指数应用于高分辨率遥感影像中建筑物提取[J]. 测绘学报, 2014, 43(5): 514–520. 巫兆聪, 胡忠文, 张谦, 等. 结合光谱、纹理与形状结构信息的遥感影像分割方法[J]. 测绘学报, 2013, 42(1): 44–50. WU Zhaocong, HU Zhongwen, ZHANG Qian, et al. On Combining Spectral, Textural and Shape Features for Remote Sensing Image Segmentation[J]. Acta Geodaetica et Cartographica Sinica, 2013, 42(1): 44–50. HU Zhongwen, ZOU Qin, LI Qingquan. Watershed Superpixel[C]//Proceedings of 2015 IEEE International Conference on Image Processing. Quebec City, QC, Canada: IEEE, 2015: 349-353. 陈杰, 邓敏, 肖鹏峰, 等. 利用小波变换的高分辨率多光谱遥感图像多尺度分水岭分割[J]. 遥感学报, 2011, 15(5): 908–926. CHEN Jie, DENG Min, XIAO Pengfeng, et al. 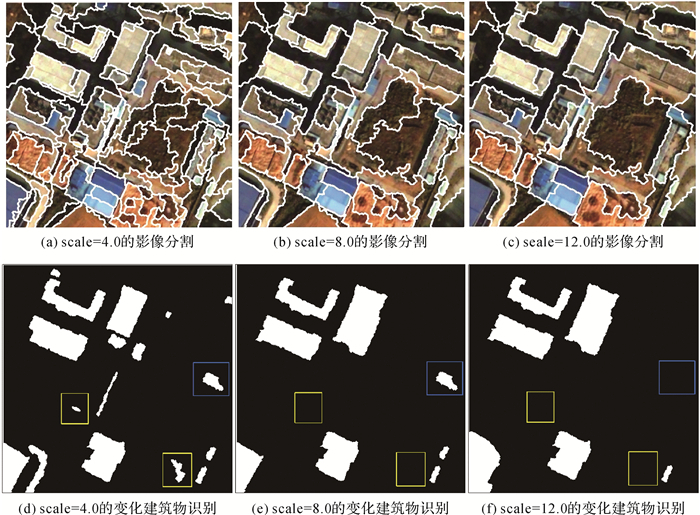 Multi-scale Watershed Segmentation of High-Resolution Multi-spectral Remote Sensing Image Using Wavelet Transform[J]. Journal of Remote Sensing, 2011, 15(5): 908–926. HERMOSILLA T, RUIZ L A, RECIO J A, et al. 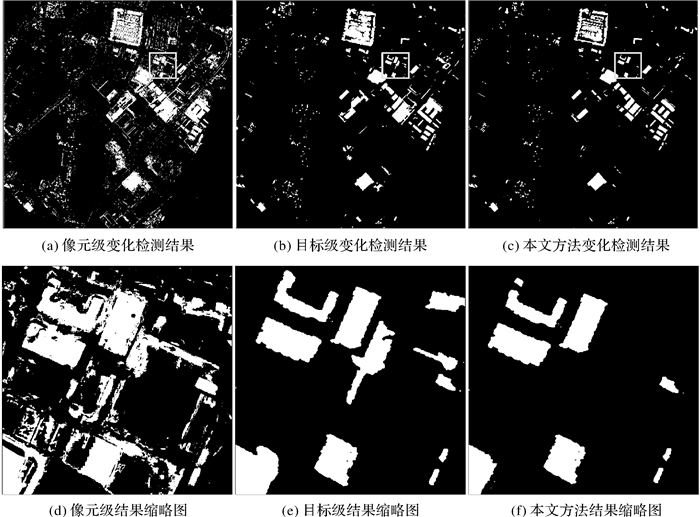 Evaluation of Automatic Building Detection Approaches Combining High Resolution Images and LiDAR Data[J]. Remote Sensing, 2011, 3(6): 1188–1210. 林祥国, 宁晓刚. 融合直角点和直角边特征的高分辨率遥感影像居民点提取方法[J]. 测绘学报, 2017, 46(1): 83–89.